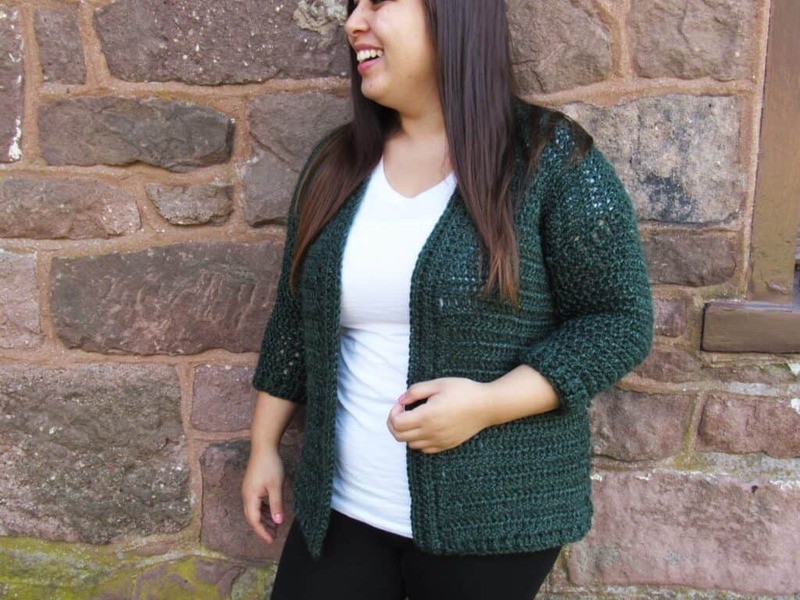 Here you will find the pattern for the Heartland Cardy in sizes Large & XLarge. For the main page of the Heartland Cardy post and for sizes Small & Medium click here. Model (me) is super short (4’10”) so for my personal cardigan, I made a medium but made mine 3 rows shorter. You can easily adjust the length by adding or taking away rows in multiples of three for the back panel and both front panels. Everything else in the pattern will stay the same. Adding/taking away 3 rows will add/take away about 2 inches. I think the sizes run small, if you are on the fence about what size to pick or would rather a bit more of a lose fit – go a size up. I tend to crochet loosely. Please please check your gauge so your cardigan will not turn out too small. You can find the general construction here on the main post of the Heartland Cardy. Attach yarn 12 spaces away from the first panel. You will have 11 stitches between both panels. Sew front panels to back panel together by whip stitching up the sides. Leave 12 rows for arm holes. **Turn inside out. Once you have turned inside out, this will be the ‘right side’ of your cardigan. Attach yarn in ‘armpit’ of the hole left from sewing up the sides. If your stitch count is off, each time you decrease in a row, you should have two less than the last row. Sew front panels to back panel together by whip stitching up the sides. Leave 13 rows for arm holes.